There have been recent changes in blood pressure guidelines released by the American Heart Association, so millions more Americans are now considered to have high blood pressure. While many will be taken aback by a new diagnosis of stage 1 hypertension with a blood pressure reading of 130/80, the good news is that the condition is highly manageable. To determine if your blood pressure is in a healthy or unhealthy range, it’s important to get it checked. Because blood pressure fluctuates, multiple readings are often necessary before a diagnosis is given. High blood pressure is often referred to as a silent killer because it can damage blood vessels and increase the risk of serious health threats without any noticeable symptoms. In fact, it can go undiagnosed for years until there is a cardiovascular event, such as heart attack or stroke. 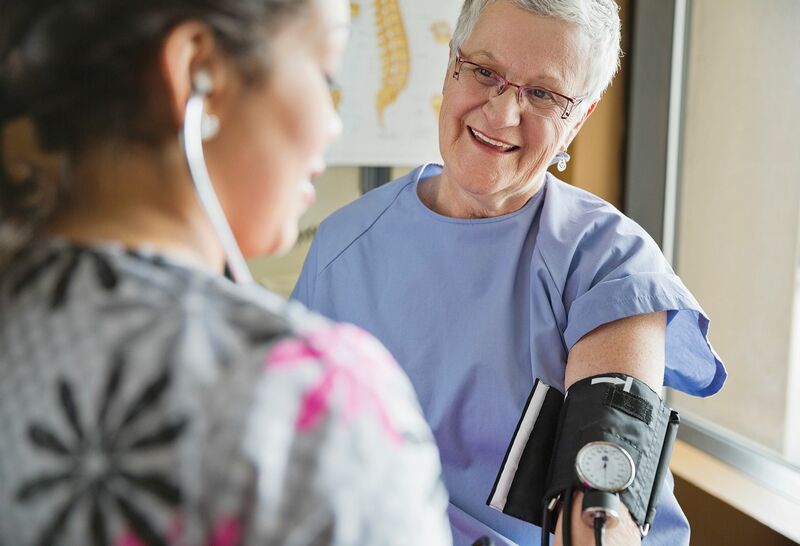 Primary healthcare providers, as well as an increasing number of other medical professionals, routinely check blood pressure during office visits. With the new guidelines in place, a larger number of patients will be identified as having high blood pressure. Making smarter food choices - Eating more whole grains, fresh fruits and vegetables, and reducing salt intake. Managing weight – Losing as little as three to five pounds can help reduce blood pressure levels. Sleeping well – Inadequate sleep can negatively impact blood pressure levels. Reducing stress – Giving yourself enough time to get things done and not promising too much can help reduce your amount of daily stress. Exercise – Physical activity can help control blood pressure, as well as manage your weight, strengthen your heart and lower your stress level. Giving back – Along with helping others, volunteering and donating also gives a boost to your physical and mental health. According to a study published in the international Journal of Psychophysiology, individuals who gave social support had lower blood pressure than those who didn’t. Because the response from blood pressure medications differs from person to person, depending on factors such as age, gender, race and medical history, it’s not unusual for a doctor to prescribe several medications before finding the one(s) that work best. If you’ve been diagnosed with high blood pressure, regular home monitoring makes sense. There are easy-to-use, affordable blood pressure monitoring devices for home use that can help you determine your average blood pressure and track progress when making lifestyle changes or taking medication. An automatic monitor with a cuff that fits around your arm that keeps track of readings is the best option. Checking pressure once in the morning and once in the evening for a week can usually enable you to determine a clear measurement. Regular monitoring every few weeks after that can help you keep track of any changes. Find out more about managing your blood pressure. At Katz Institute for Women’s Health, we’re here to answer your questions. Call the Katz Institute for Women’s Health Resource Center at (855) 850-5494 to speak to a women’s health specialist.